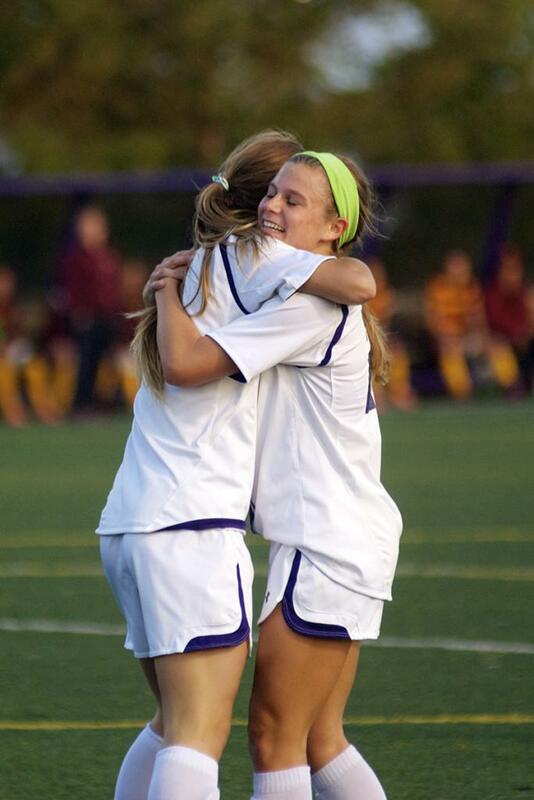 Junior forward Katie Landgrebe embraces freshman forward Addie Steiner during Saturday’s match against Minnesota. Steiner scored her first career goal versus the Golden Gophers. Northwestern hopes to sustain its joy and earn another victory as Big Ten play continues Thursday. Northwestern finally has a Big Ten victory. The agonizing wait and expectations are over. Its season, however, charges forward. On the heels of their win over the Golden Gophers, the Wildcats will face two more familiar foes Thursday and Sunday: Ohio State and Illinois. The Cats (3-9-2, 1-5-0 Big Ten) kick start their weekend 6:30 p.m. Thursday against the Fighting Illini (7-5-2, 2-3-1) at Lakeside Field. Moynihan is confident his team can keep its forward momentum but recognizes the challenge that lies ahead. “We beat them last year at their place, so I’m sure they’re coming back here with revenge on their minds,” Moynihan said. Illinois is fresh off a win against No. 20 Wisconsin. The Fighting Illini, however, have struggled on the road, with only one win and a tie but four losses outside of Urbana-Champaign. Illinois has excelled in an area where NU has faltered — scoring goals. The Fighting Illini have scored at least one goal in each of their games this season, except one. Forward Jannelle Flaws not only leads Illinois in goals and points, but the Big Ten as well. She ranks second in the nation with 15 goals. NU is feeling great after its first conference win Saturday against Minnesota. The team was able to capitalize on its opportunities and finish — something it struggled with in previous games. Steiner earned her first career goal in that game. Both Steiner and Landgrebe were assisted by Allen, who added to her legacy at NU. The four-year starter is now in the all-time top 10 for NU in career goals, assists and points. After the Cats square off against the Illini, they will take to the road to face the Buckeyes (8-3-3, 2-2-2) Sunday. Ohio State is coming off a win against Michigan State.